Get Your Digital Copy of Travis Country Times Now! Get the latest real estate news in your area! Travis Country Times is going digital. 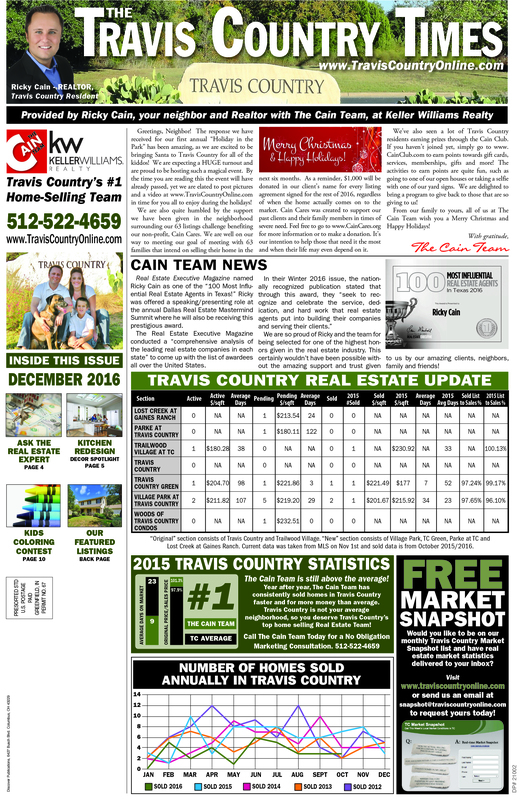 The official publication for Travis Country by Cain Realty Group is reaching out to a larger audience. If our hard copies aren't reaching your doorstep, you can easily access the latest news, trends, and all things Travis Country just by downloading our digital copy for the December issue here. Get FREE access to the latest Travis Country market stats, real estate trends, investment advice, home design tips, and more, just by getting your very own downloadable copy. Stay informed about the community! Download your very own copy and be in the know! Thank you for trusting Cain Realty Group, Austin's Most Trusted Home Buying and Home Selling Team!